Today is the day I leave the house by the sea. Sob. In tribute, I thought I’d post some creative nautical decorating ideas using oars. Pottery Barn & Pottery Barn Kids have several oar options for your purchasing pleasure. The one below would be fairly simple to recreate on your own. I found this next image from a site called High Camp Home. (If I lived out West in the mountains and had money to burn, I would furnish my entire home from this company.) I love the idea of using small oars in the place of drawer pulls. Cute! Have several old oars in your attic? Why not create a coat rack like this one (also from highcamphome.com)? This idea is one of my favorites! 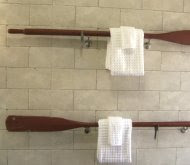 Create towel racks from vintage oars. LOVE it. In the next two pictures, oars have been used as curtain rods. Cottage quaintness at it’s coziest! Or…oar? :)…use a long paddle as a stairway banister. I would love to redecorate this house by the sea, but after all it is not my home and nailing things into the wall would be overstepping my boundaries to say the least. However, I just cant help myself from doing something before I leave. I found some oars in my parents’ garage…the same oars from my childhood that we used to paddle our inflatable raft around Lake Michigan when we lived in the house by the lake. Sigh. That house was another amazing home. I simply placed these oars on either side of the gas fireplace. I love the simple nautical charm it adds to this space. And…if my mom doesn’t like it the oars can be easily placed back into the corner of the garage! I promise my feelings won’t be hurt Mom :). Thanks again for allowing us to house sit for you and for allowing my creative juices to be inspired by new surroundings. « All Good Things Must Come to an End…. regarding this web page and now this time I am browsing this website and reading very informative articles or reviews at this time. I love those curtain rods… What a cool way to use oars! I like the oars by the fireplace. Let us know what your mom thought of them.